Snow is one of my favorite things about winter. There’s something so cozy about watching the snow fall outside while you curl up with a blanket and a crochet project. It doesn’t snow much where I live, though, so this little snowflake is my solution. They’re perfect for a gift topper, hair clip, or strung together in a garland. With only 2 rounds, you can make a pile of them in a few hours…and these snowflakes won’t give you frostbite. Since the snowflake is so small, it’s most efficient to use the snowflake itself as your gauge swatch. Crochet the 2 rounds of the pattern and determine if you like the size. If not, increase or decrease your hook size to make the snowflake bigger or smaller. Rounds 1-2 in pattern measure 3″ (7.5 cm) in diameter (from point to point). Join to first sc with seamless join and weave in ends. 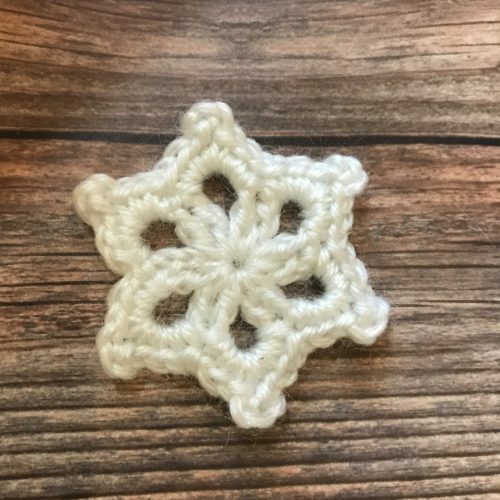 This entry was posted on Wednesday, February 6th, 2019 at 10:47 AM by Claire Golden	and is filed under Free Crochet Patterns. You can follow any responses to this entry through the RSS 2.0 feed. You can skip to the end and leave a response. Pinging is currently not allowed. could this be the center of a granny square?? it’s so cute! That’s a great idea, Michal! I’ll play around with that. Since it has six points, maybe a granny hexagon, too…thanks for the suggestion! What a sweet, simple snowflake! I love it. Thank you Erica! I like how quick they are to make. Most of the tutorials here on Crochet Spot have both left and right hand photos.